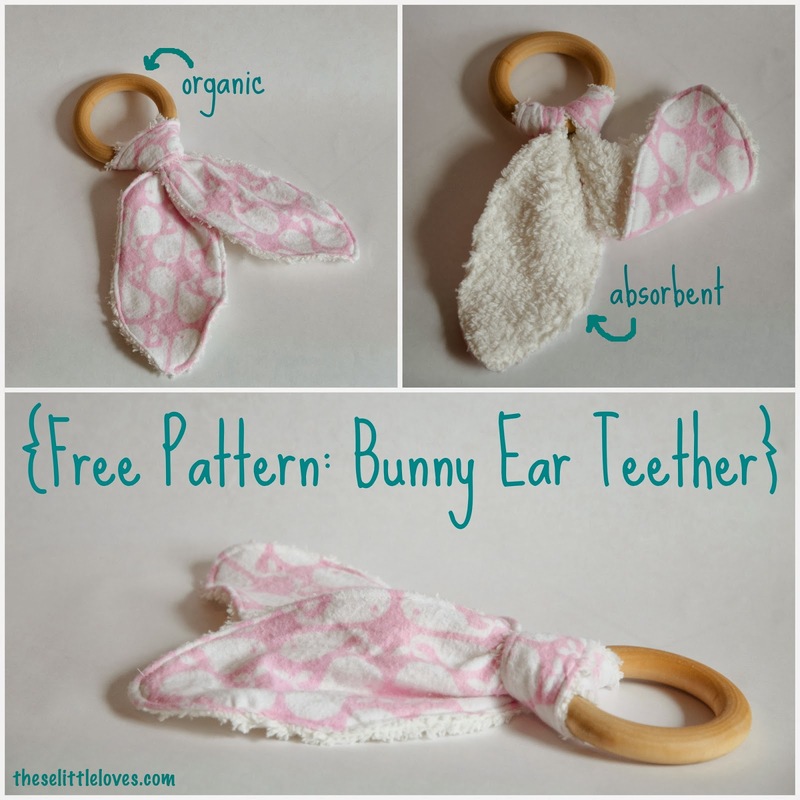 These little bunny ear teethers are great on so many levels. Multiple textures to interest baby? Check. Absorbent materials for all that 'adorable' slobber? Check. Easy for little hands to hold? Check. Inexpensive and easy to make? Check! And bonus - these little guys are great for traveling. Just attach a pacifier clip to the ring and clip to baby. Baby won't drop it on the plane or car floor. I use chenille and flannel for these teethers because that is the same fabric I use in my favorite burp cloths (read absorbent). The wooden rings I source from Etsy (link above). I get organic, all natural, etc as this toy will spend lots of time in the baby's mouth. 1. Cut printed pattern piece. 2. Fold the flannel strip in half and pin pattern piece to the fabric lining up the 'fold' line with the fold in the fabric. Cut out pattern piece. Do not cut the fold. 3. Repeat step 2 with the chenille fabric. 4. Lay flannel and chenille right sides together and pin. 5. Sew with a 1/8" seam allowance around the edge of the fabric EXCEPT for one side of the thinnest middle section (this is left open so you can turn it right side out). With such a small seam allowance it is important you go slowly and carefully while sewing to ensure the fabric stays in place. Every now and then I get a piece of flannel that wants to stretch on me and I have to reduce the foot pressure and make sure I keep everything lined up. 6. Turn the material right side out through the open section. Use a point turner if necessary. 7. Fold in the fabric at the un-seamed section to match the adjacent seam and pin. 8. Top stitch around the entire piece of fabric (I also do a 1/8" seam here), ensuring the open section is closed by the seam. 9. To attach to the ring, make a 'U' out of the fabric strip and place it over one side of the ring. Then pull the bunny ears under the ring and through the thin section of the strip and pull tight. To clean, simply remove the fabric portion, wash and dry with your other baby clothes, then reattach as in Step 9. Want to make a matching burp cloth? Try this.